This article has been seen 19757 times. The cedar pine reproduces by seeds. The germinating capacity of seeds is preserved for up to four years. After sowing, the seeds are loosely covered with soil. The seeds germinate in the year they are sown or in the following year, more rarely in the third year, after germination the young shoots must be kept in the shade and watered, in the second year the seedlings develop only the top shoot, in the third year they form the first whorl of lateral shoots. The young plant acquires a crown usually by the time it is 5 to 7 years old, and by 15 to 25 years of age is covered with branches almost to the ground. At 20 to 30 years of age, the lower branches begin to die off, and the crown acquires an oval shape. The seeds of the cedar pines are prepared from the middle of August-beginning of September until the middle of November. In the case of a delay in the ripening of the cones, they are collected in the spring. In order to grow the seedlings, it is recommended to sow seeds that have been stratified in the spring. In the case of further transportation of the seeds, it is important not to allow them to dry out (moisture content of less than 8-10%) or heat spontaneously, which occurs when the moisture content is greater than 20% and they are stored at a raised temperature. Seeds with an underdeveloped germ must not be extracted from the cones for two or three months before they ripen. The seeds of the Siberian and European cedar are stratified at a temperature from-4 to +3C over three to five months. The stratification of the seeds can take place in an ice box, a deep trench, cold basement, in boxes under the snow, and in cold rooms. The seeds are mixed with two to three times their volume of sterile substratum (sand, sawdust, peat, moss). When placing them for stratification, the seeds should have a moisture content of 20 to 40%, while the substratum should have the least (field) moisture capacity. In all methods of stratification, it is necessary to provide good drainage and protection from rodents. To create a supply of viable cedar pine seeds, methods of long-term storage (up to 2.5 years) in deep trenches (2.5 metres) may be used. In the latter, a constantly lowered temperature and moisture content is provided. In order to hasten the appearance of shoots and reduce losses from rodents, in the spring planting it is expedient to use seeds that have begun to sprout slightly. For one linear metre 120 to 140 seeds are placed at a depth of three to four centimetres. Protection of the shoots from birds is ensured by covering the surface of the soil with a layer of sawdust (3-4 cm). The technology of growing the cedar seedlings is no different from that used for other conifers (shade, watering, protection from flattening, cultivating the soil, weeding). Stands of cedar pines are created by planting on partially worked soil (furrows, beds, terraces) in the spring, autumn, and in the second half of the summer (in areas with increased humidity in July and August). When growing forest stands of cedar, attention should be directed to the creation of solid, pure stands of cedar in conditions of fresh and moist coniferous forests growing in relatively rich soils, or more rarely in mixed pine forests growing in sandy soils. Even though they are very tolerant of shade in their first years, cedar pines nevertheless give the best growth performance in conditions of sufficient illumination. The competition of grass has a great influence on the intensity of the growth and the preservation of cedar stands. The experience of producing a cedar in various forest-growing conditions of Central Siberia has convincingly shown that the intensification of its growth and high preservation may be achieved only by caring for it over the course of seven to nine years. In optimal growth conditions and with intensive agricultural technology, already at 15 years of age Siberian cedar plants reach a height of 3.5 to 5 m. The beauty and severity of the majority of coniferous trees cannot leave anyone indifferent - they very much coincide in mood with the image of our northern landscape! In order to grow coniferous trees successfully in a cultivated plot (or outside its fence), several obligatory rules must be remembered. Thus, the planting of coniferous species in the same group with deciduous trees, or their combination in a single hedge cannot be permitted. Coniferous trees do not tolerate contact with the branches and leaves of their deciduous fellows, which, as is said, "whip" them (that is, remove the needles). After this type of "interaction," the tops and a part of the crown of coniferous trees dry out and are rarely able to recover their previous form and beauty. In addition, hedges and groups made up of only conifers are more decorative. The planting and transplanting of coniferous species is permissible only when the ball of earth around the roots is preserved. Only very young saplings (2 to 4 years old) taken from a nursery may be planted in the early spring without this ball, as long as the roots are not permitted to dry out. If you are growing conifer seedlings in your beds (this is entirely possible), then it is expeditious to do it in soils that cling well to the roots of saplings that are dug up. 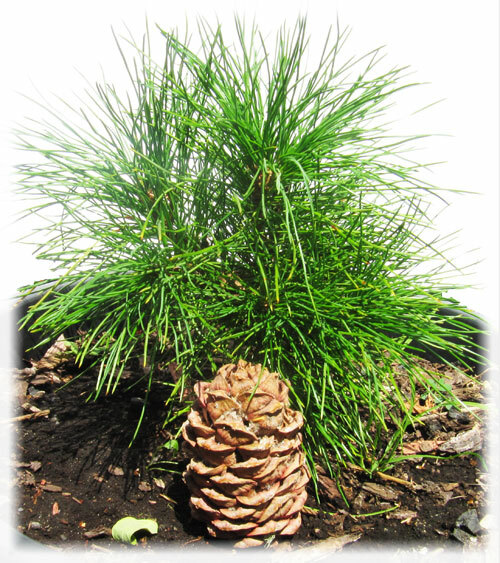 But it is also possible to grow coniferous seedlings in special baskets, boxes, or jars buried in the soil. These seedlings are ready for transplanting to their permanent place of residence at any time of the year. When transplanting evergreen seedlings from a forest, it is necessary to remember yet another rule: do not take saplings that are growing in a shaded part of the forest - they will die from the sun's burning heat and the dryness of the air, and in the best case, having lost their decorative shape, will be recovering from this malaise for many long years. It is best to direct one's choice to saplings that are growing in open, sunny clearings or at the edge of a forest. "Let each inhabitant of a large city take a tiny nut from a resinous cedar cone, hold it in his mouth, bathe it in his saliva, plant it at home in earth in a small pot, and water the earth each day. Before watering, let him dip his fingers into the water, his mood should be good, and let him wish himself, and, most importantly, his descendants, his children, good and the consciousness of God. And do this every day. When the shoot emerges, he can mentally converse with it about what is secret. On a summer, frostless day, at night, the pot with the small shoot should be placed outside among other plants. Let it begin to communicate with the stars, moon, and sun, let it know the rain, the breeze, and the spirit of the grass growing nearby, and it will come back inside again to its friends, its parents. This should be done on many occasions, when you have the desire and the time. This shoot is growing for the ages, after all, a cedar will live for more than five hundred years, it will give descendants, and tell new cedars about the spirits of those who grew them. When it has grown to thirty centimetres inside, in the early spring the shoot may be planted in the earth. Let the municipal authorities allot at least one square metre to all those who do not own land. And the shoots will be planted from the edge of the city to the riverbank and along the roads, among the houses and in the centre of crowded squares, let the people each look after their shoot, and let them help each other. From all corners of the earth people will come to this city for centuries to look, to touch these sacred objects, to exchange even a word with its happy people." The germs of the micro- and macrostrobila in the Siberian cedar are laid down in July and August, flowering and pollination take place in June or July of the following year, and continue for 3 to 7 days, fertilization of the seed-buds occurs a year after their pollination, then over a period of 50 to 60 days the formation of the seeds is completed. The selection of the optimal period for the procurement of cedar seeds has great significance for ensuring a high productivity of work and the reduction of the damage to the trees when using existing methods of collecting the cones. 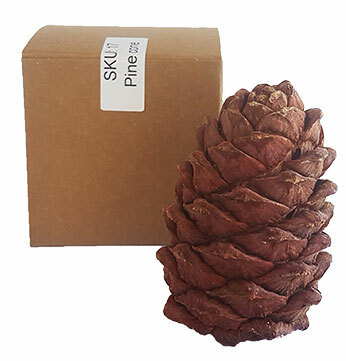 Characteristic of cedar pines is an unevenness in the harvests of their cones and seeds over the years, especially in extreme growth conditions. The size of the seed harvest depends on the weather conditions in the pollination and fertilization period, and is also related to solar activity. Highly productive trees in cedar orchards yield from 40 to 100 kg in a year, while in natural stands the yield is only from 8 to 20 kg. The thinning out and pruning of cedar saplings has made it possible to advance the stage of lengthy seed-bearing in cedar forests by 50 to 120 years in relation to natural plantations. In cedar stands the air is pure and wholesome. The antimicrobial properties of cedar forests are high. The health-improving properties of cedar stands has been pointed out by I. Ya. Slovtsev, an expert on Siberian forests. He wrote that "cedar forests always have an aromatic freshness." V. Gomilevskiy cites some interesting data in his work. When characterizing the Siberian cedar as a valuable tree, the author notes that this type of plant acts in a way to frighten off harmful insects. In particular, he writes, "Gadflies, horse-flies, mosquitoes, gnats, and insects called by the common name of "midges" avoid the Siberian cedar, in all probability, driven away by the resinous odor, which is especially strong during intense heat and after dusk." Cedar stands, thanks to the emission of bactericides, fungicides, and protozoacides, make the air more healthy and destroy pathogenic microorganisms, and impart wholesome properties to the air. They possess antimicrobial effects with respect to diphtheria bacteria. The quantity of microbes in the air decreases with an increase in the proportion of Siberian cedar in the composition of the stands. In addition, if a pine forest has an unfavourable effect on certain cardiac patients, in cedar stands "even with a very large saturation of the vapours of cedar essential oil, no negative deviations or indications of the ionization of the air are observed" (Sverchkov, 1964, p. 18). All this confirms the sanitary-hygienic and even preventive medical importance of cedar stands. Taking all this into account, it is necessary to plant more Siberian cedars in our suburban forests, in resort areas, in urban squares, gardens, and parks, especially because the Siberian cedar is more tolerant (in comparison to other conifers) of smoke and gases in urban conditions. On a hot day it provides good protection for a person from the intense summer heat. The most important biological feature, which also has great practical significance, is the great hardiness of the Siberian cedar in winter. This is one of the representatives of the nut-bearing plants that is not afraid of harsh winters and extends far to the north. Among the coniferous species, the Siberian cedar is the most smoke resistant tree, and can propagate in large industrial cities. The cedar (Greek: kedros; Latin: cednis), owing to its harmonious proportions, similar to a cypress, was considered a valuable coniferous tree of the Mediterranean area, and already at the dawn of Egyptian history was brought from Lebanon to the country on the Nile, a country barren of trees. The wood of the cedar was also valued because of its fragrant resin, and was used in Egypt for the construction of ships, and the manufacture of furniture, coffins for mummies, and utensils. King Solomon used it in the construction of the temple in Jerusalem. In a Psalm (92:12) it is written: "The righteous shall flourish like the palm tree: he shall grow like a cedar in Lebanon." Origen (185-254), a father of the Church, characterized the moral and symbolic side of the concept of longevity in the following manner: "The cedar does not decay. The foundations of our homes, foundations made from cedar wood, preserve our souls from decay." Bishop Kirill Aleksandriyskiy (412-444) compared cedar wood with the body of Christ, which remains imperishable. Only the wrath of God is stronger than the cedar: "The voice of the Lord breaketh the cedars; yea, the Lord breaketh the cedars of Lebanon." (Psalms 29:5). V. Kh. von Khokhberg (1675) moreover emphasized the characteristics of the longevity of the cedar: "Solomon's temple was built of cedars. For the reason that this wood stands for many years without being destroyed or eaten by worms. When the Lord comes to bless His possessions, He will not be met with misfortune or loss." The cedar is the heraldic symbol of Lebanon, although, unfortunately, it has now been almost completely exterminated there. In Christianity, the cedar, especially the cedar of Lebanon, is a symbol of Christ: "...his countenance is as Lebanon, excellent as the cedars" (Song of Solomon 5:15). The majestic appearance of the cedar began to be identified with the concept of beauty and grandeur. The Prophet Ezekiel used the cedar as a symbol of the Messiah and His Kingdom: "...I will also take of the highest branch of the high cedar, and will set it; I will crop off from the top of his young twigs a tender one, and will plant it upon an high mountain and eminent:" (Ezekiel 17:22). Clay tablets of the Sumerians, found during archeological excavations of the ancient Sumerian kingdom, confirm that, 5000 years before the modern era, extracts and broths of needles were used in the form of compresses and poultices. But cedar resin was also no less valued in prehistoric times. A cup of cedar resin was a part of the ritual of the consecration of King Khorassan. The flame of Zoroaster was born from burning resin in a cup. Among the druids a cup of cedar resin was called "the cup of life."